Trending Up: Tiny Food – Next Hipster Trend is what's HAWT, NEXT! Many of our recommended trends are naturally grandiose and full of noticeable flair. Not so with this up-and-comer. It’s all about subtlety and miniature modesty. It begins with you reading this article with studious interest and ends with you hosting an amazing hipster dinner party. After all, you haven’t thrown one since your coconut oil fiasco, so your friends will be chomping at the bit. 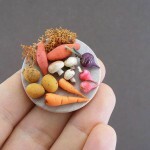 In addition to this article I recommend picking up “Tiny Food Party! 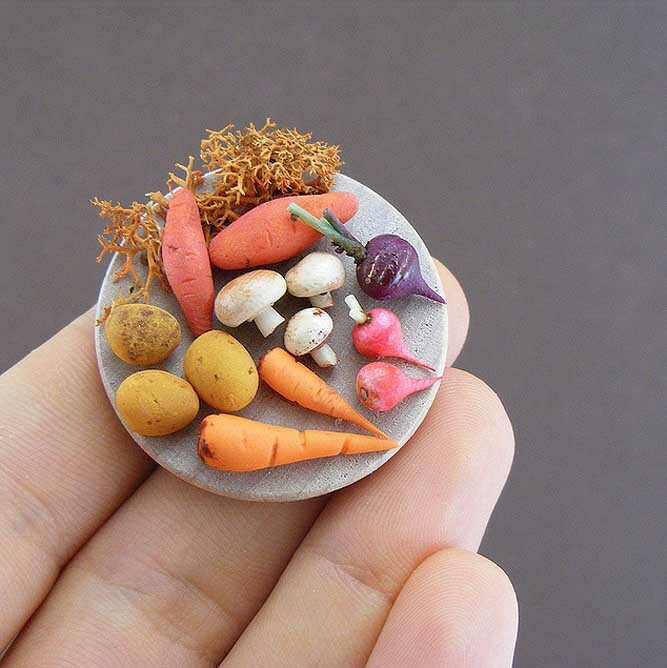 : Bite-Size Recipes for Miniature Meals” and reading it on some sort of public transportation. First up, you’re going to need to make a trip to the farmers market (you already go there daily anyway). Don’t be distracted by the big beautiful local organic free-range cruelty-free fruits and veggies. You’re looking for only the littlest and cutest of the offerings. I suggest starting with a classic tiny food staple: baby corn. Everyone’s going to expect it so you might as well not let them down and it’s not as gauche as cocktail weenies. Proceed to fill your smallish free-cycled coffee bag with all sorts of tiny. Baby bok choy, baby carrots, baby zucchini, baby turnips, baby grapes, baby apples … you get the idea. Definitely get some shallots so you can make microscopic onion rings. Melt my heart, that will be darling. Next up, animal products. Look, I realize that boss-level hipsters are all vegans and/or freegans, but many of your friends are scattered across the established hipster spectrum. Lots of them eat meat, but only if it’s ethically-raised free-range cruelty-free organic non-injected happy meat from a local farmstead that offers a free gym membership to the animals. Anyways, you’re gonna need some tiny cuts of meat. Everyone’s mind automatically jumps to baby back ribs because of Chili’s and Austin Powers 2, so we’re not going that route. Heck, just get a nice 10oz sirloin with good marbling and cut it into 37 tiny steaks. After that you’re definitely going to need some cage-free quail eggs. Wait. Quail eggs are gigantic. You’re gonna need hummingbird eggs. I’m not sure how we’re going to pull this one off. Heading to google … okay I’m back, first and foremost, holy smokes these things are adorable. It turns out that this is pretty easy. You just need to find a hummingbird nest with freshly laid eggs and take them. No problem! Beware though, it looks like the little bastards are pretty defensive. Don some sort of protective head cover when you harvest the eggs. In the event that you don’t own a beekeeping mask (which you should if you’re reading this) maybe you can up-cycle a bucket, don’t forget the eye holes. Pop the itty-bitty gems into your handcrafted danish modern tiny egg carton and off you go. Don’t worry, the momma bird will lay new eggs in a matter of days and all of this is totally free-range! As a bonus, you’re also foraging now (awesome), but that’s another trend for another day. While we’re foraging, another idea is rather than an enormous lobster tail, prep-up single crayfish tails for each plate. Don’t use a trap to procure them, catch them individually by hand. Your guests will marvel at your attention to detail. 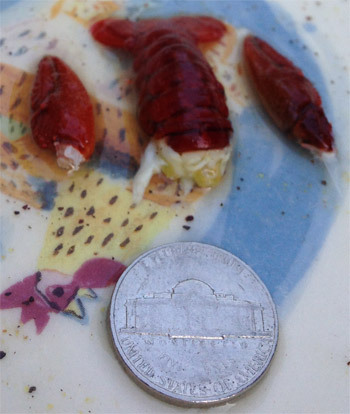 Crayfish, hand-caught by the author and niece Liv with nickel for scale. Yes, we really did this. Now that your ingredients are assembled, and assuming your eyes weren’t feverishly eviscerated by angry hummingbirds, you’re ready for the big day. Dive deep into the theme by sending out tiny invites to your friends. Have the table set with dollhouse plates and tiny cutlery for at least ten solid hipster guests and make sure there is a tiny guide that details each course. In this guide you can’t use the words “gluten-free” enough. I don’t know what gluten is (something with wheat I think), but I do know that hipsters don’t want to eat it or even be in the same room with it. Hell, gluten is like hipster kryptonite. But I digress. Cooking time should be limited to a matter of seconds as the thermal mass of each item is so miniscule. Be careful not to overcook the steaks by searing them longer than 2-3 seconds per side. Also, watch those hummingbird eggs, they are properly poached the instant they hit boiling water. Season with extra small salt crystals and ultra-fine ground pepper (details, people). Garnish each plate with a single oregano leaf. As you nibble (never bite) go into detail about the health benefits of scaling down portion sizes and the unfortunate obesity epidemic in America. In addition to ungodly amounts of GMO corn syrup being injected into everything we consume, you’ll get to blame it on gluten, which your guests will love. Later on, at the after-party (hipsters LIVE for after-parties), while you are sip-chugging craft pico-brews from super tiny red plastic cups (if they give you any guff about plastic, tell them there’s a Low song about plastic cups so they can STFU) look upon your assembled hipster acolytes, stroke your beard, and proudly proclaim “micro-foods naturally have more micro-nutrients.” They can’t argue with that logic, even if they don’t know why.